When it comes to people, I’m very patient. I’m always holding out hope someone will finally change. I’ll calmly explain a concept ten different ways to help someone understand. I don’t typically get road rage – I assume someone has a dire emergency or they wouldn’t have dared to cut me off. (Just let me live in that bubble, I’m happy there!) I’ve even learned how to patiently wait in line at the DMV or just enjoy reading my book when my flight is delayed. But when it comes to big purchases or life changes? I want it now. Once the decision has been made to buy a new car, I want to buy the first one I see at the first car lot I visit. I have zero patience for “shopping around”. I should also not be allowed to house hunt, because there is no “hunting” involved when I quickly sign the first contract I’m offered. And planning for an entire year for a wedding ceremony that lasted 20 minutes? That was brutally hard for me. If I did it again (I’m still hinting for that vow renewal), I’d skip the planning and just hop on a plane destined for a secluded island! And society does nothing to counteract my “want it now” tendencies. The commercials, the credit cards, and everyone around me buying bigger and better things…it’s a constant struggle. Sigh. My latest frustration is actually more than all of these things. It’s my life path. I feel as if it’s less of a path these days and more of an out-of-control roller coaster that I’m desperately trying to drive. This life journey is like a giant puzzle, and I get very excited when I discover a piece that feels like I placed it in the right spot. This is it! Let’s go full speed! Only to hit the brakes a few days later. Sometimes getting tossed from the roller coaster car completely. And then I am reminded. I am a mere human. My head almost explodes when I find just one little piece of the path, glimmering under the rubble. My mind is completely blown when I look back at the path behind me and try to comprehend how all the pieces worked together to get me this far. I am in awe for hours just trying to understand the inner workings of an ant society, or how vital bees are to the intricacies of nature and our very survival on this planet. So I should not be surprised that I cannot fathom what God has done from beginning to end. I should be grateful that instead of watching me spontaneously combust from seeing more than I can handle, God lovingly hands me only one piece at a time. Because if I got overwhelmed by the entirety, I might fearfully say no to something amazing! So how do I get better at this waiting thing? There is so much to do! So many ways I could be helping! Why isn’t it clear? How do I patiently wait for God to hand me the next puzzle piece? Am I wasting valuable time just waiting for instructions? I’m impatient because I’m trying to take back control. I think I could do it all and do it better. But I have proven that wrong many times. Every time I try to control a situation, I make a bigger mess of things. And it’s not just me. This has been going on since the beginning of time. (See Genesis 16 for an example of how messy things can get when we don’t just wait and trust God.) Thankfully, God can fix even the worst of my messes when I finally turn back to Him. My roller coaster feels back on track. Momentarily. Until I start to question Him again. If there is something big coming in my path, don’t I need to be prepared? Don’t I need to know about it now, so I can be ready for later? Shouldn’t I save up money? Or start laying groundwork? I worry about the future! How can I plan for it if I don’t know what it is? I need to have faith. Faith that He will tell me when and how to plan, if I listen. Faith that God will provide the necessary means to complete the tasks He has planned for me. Faith that the path isn’t actually hidden. Sometimes it’s just blending into the distractions of the world. Remember Indiana Jones doing the walk of faith in The Last Crusade? There may be times when I have to step off the ledge like Indy – onto a tiny rock path that I can’t even see. And there may be times when I have to wait patiently, knowing that it will work out better if I let God have control of the plans He has made, instead of trying to do it myself. So how do I navigate this? Like a puzzle, I start with the easy outside pieces. The pieces I feel confident about. Then I work my way into the messy middle of it. When I step back from the unfinished puzzle, the pieces I thought would be the toughest now have an obvious place. I can see how the easy, boring pieces clearly had a purpose…to help me see how to fit in the tough pieces. And what’s even more interesting, is that I’m starting to understand that my puzzle doesn’t actually have outside pieces. They were outside pieces when I was focused only on ME. But now they are being replaced with pieces that interlock with a much bigger puzzle. 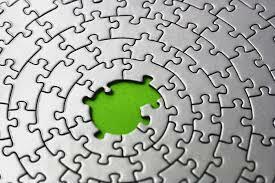 Sometimes the pieces God hands me have nothing to do with me, but are necessary to help build someone else’s path. And sometimes someone else brings me a piece of my path that God had given to them. Those pieces that are intertwined with someone else’s pieces seem to make the strongest part of our paths. They are powerful! I still want to know, though. Am I putting the pieces in correctly? In the right order? Am I really doing what God wants? Or am I doing what I want? What if I choose the wrong step in the path? Is there a way to know for sure? And there lies my next mistake. I constantly talk myself in circles, frustrated because the path isn’t perfectly clear to my little pea brain, when what is perfectly clear is that I’m standing in my own way. Here’s something brilliant from Lysa TerKeurst in her book, The Best Yes, that pushes me out of this “analysis paralysis”. Whenever I give myself some room to make mistakes with good intentions, the fog that is blocking my path lifts away. Now that I have been practicing and living my life more focused on God, I also feel more confident about my choices. As I mentioned in How to Have Faith, I confirm each piece of my path with His Word, His people, and His circumstances. And I also notice how it physically feels. If I really pay attention, there is almost always a tug or a pull in a certain direction. It’s actually always been there. I used to call it “intuition,” but I didn’t always follow it, for fear I might be wrong. But now I know that’s actually the Holy Spirit guiding me. Physically, it may manifest as goosebumps. A tingling sensation. Butterflies in my stomach. Or a deep calm washing over me. Now I know I can follow it. I don’t have to fear being wrong, because it’s not me. It’s Him. And He’s never wrong. I’m letting go of the need to know the final outcome before I step off the ledge. I simply follow the Holy Spirit, and watch the blessings flow. Do I still squirm a bit about not knowing? Yes. More than a bit. But I’m trying not to beg to see the puzzle before it’s done. I’m trying not to want to learn the end of the journey before I’ve traveled it. I’m trying to put my hands up and enjoy the roller coaster ride instead of trying to drive it. I’m trying to savor each step and patiently wait for the next one, knowing that one day I’ll get to look back and see the entire beautiful picture of my life. The masterpiece God created just for me and the bigger masterpiece that I’m only a small part of. Because it’s all already okay. Better than okay. I’m living out a plan devised by the Divine Creator. IT’S AMAZING. And it’s worth waiting for.